Looking to impress with a delicious Valentine’s meal for your wine-loving date? 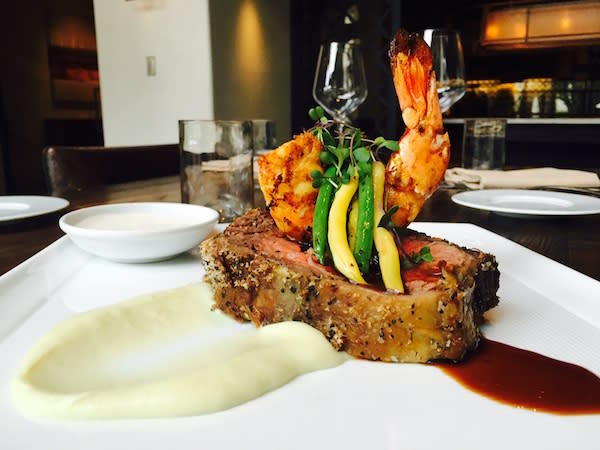 Watertable, located at the Hyatt Regency Resort & Spa, has a set menu for February 12-14, including a 10oz Herb Marinated Prime Rib with Citrus Chili Spiced Black Tiger Prawns served with smoked parsnip puree and buttered heirloom pole beans, all in a veal port wine reduction. Find a table before they’re booked here! In addition to their regular menu, Shades will be serving up a pre-fixe bottomless champagne dinner for pre Valentine’s and the big day. Enjoy Surf and Turf as the main course with Braised Short Ribs and Truffle Butter Poached Live Maine Lobster Tail. Finish it up with a decadent chocolate creation from Chef Amy Ninh. 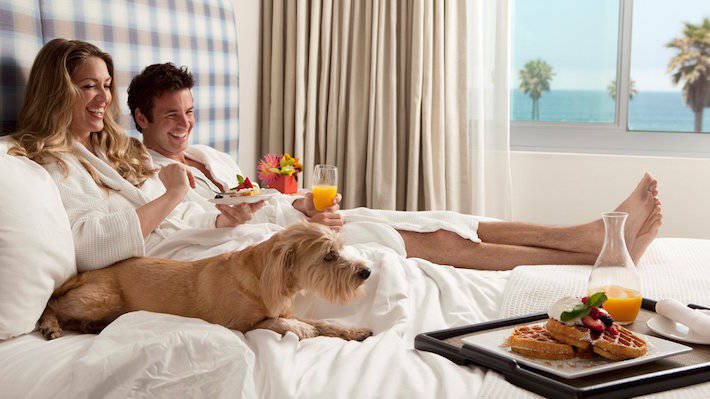 For reservations, call the Waterfront Beach Resort, a Hilton hotel, at 714.845.8444. Experience love at first bite this Valentine’s weekend with Sandy’s. A special V-Day menu will be available all President’s Day weekend long! Choose from a Prime Grade 8oz Filet Mignon, 1lb Steamed Alaskan King Crab Legs, or BOTH plus delicious sides. Don’t forget to save room for some Hula Pie. Looking to cap off the long weekend in true Huntington Beach style with a leisurely lunch on the beach? Sandy’s will open at 11am on Monday, February 15. It’s the day before Valentine’s Day and you don’t have a date… no problem! 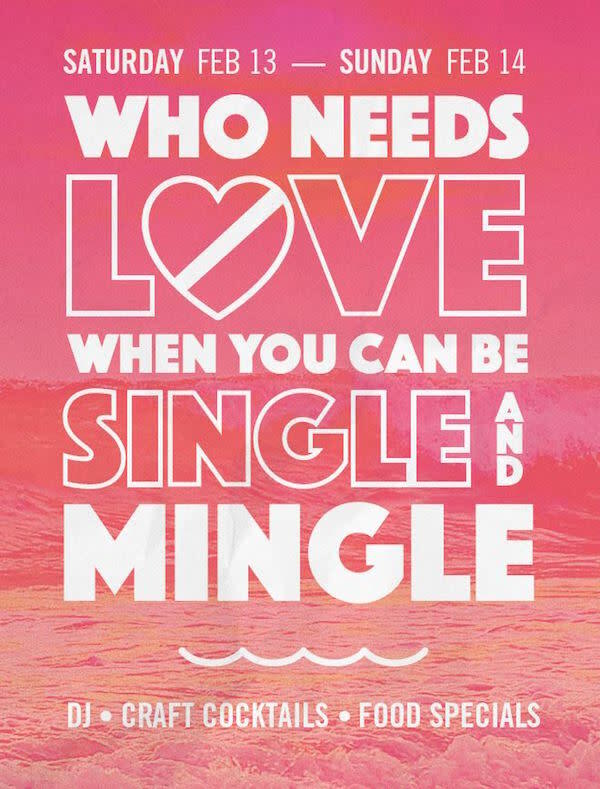 Grab your single friends and head to Zimzala at the Kimpton Shorebreak Hotel to celebrate Single’s Awareness Day. Take your pick of craft cocktails and $2.14 drinks for the ladies all Saturday and Sunday from 7pm until 11pm. A DJ will be spinning at the bar and food specials are available, all with a patio ocean view! Throwing your own Valentine’s Day party? 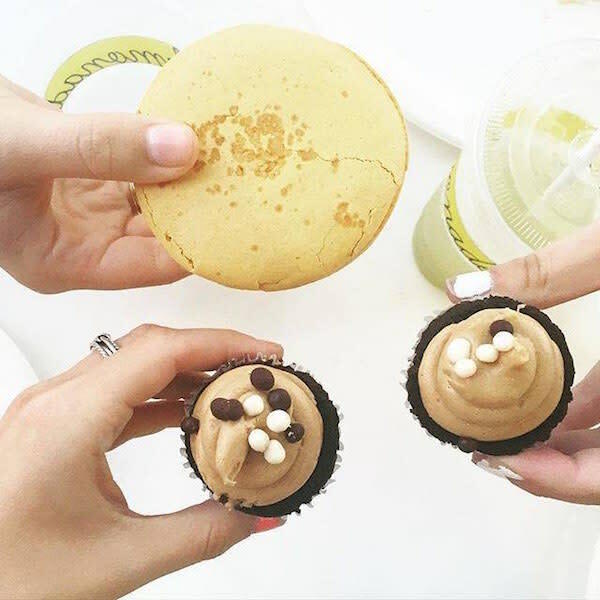 Let Lemonade take care of the dessert. Mention #ilovelemonade for 10% off your dessert catering order at Lemonade located within Pacific City. Choose from cookies such as Dark Chocolate, Flourless Peanut Butter, and Cranberry Oatmeal. Fit the theme with Red Velvet or your choice of cupcake. Or load up on tarts, bars and macaroons of all flavors. 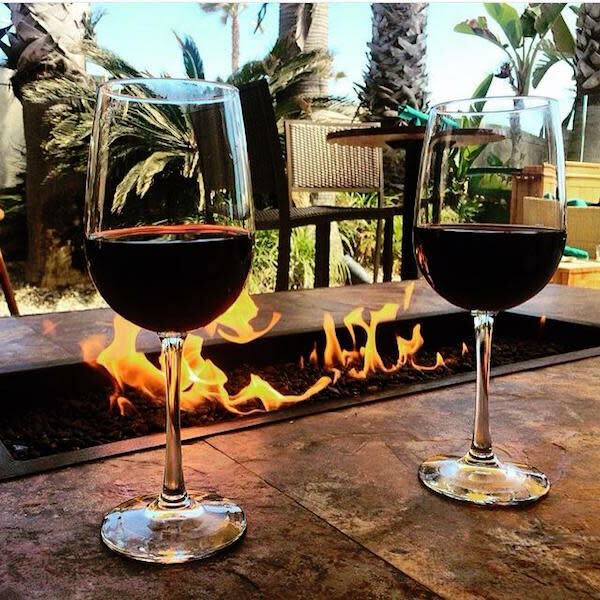 Imagine yourself and your sweetheart, bundled together under a blanket while sipping wine and enjoying the picturesque Huntington Harbour. Sunset Gondola is offering a deal on the “best Valentine’s date for 1,000 years” with their special $150, one hour gondola ride for two. Save yourself a stop at the flower shop, the package even comes with a red rose! 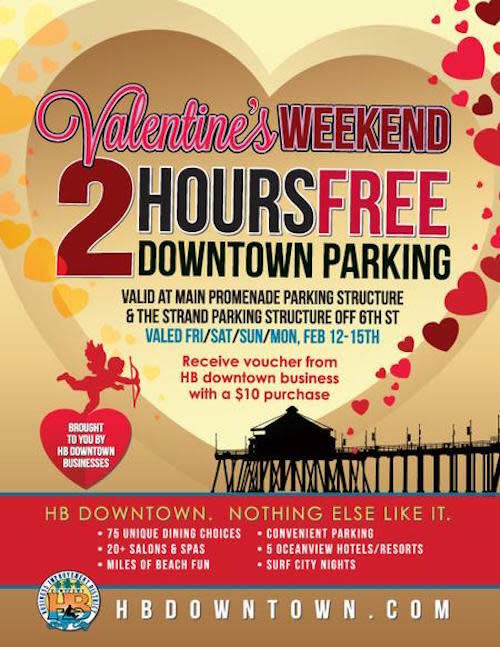 Compliments of the City of Huntington Beach, visitors can receive 2 HOURS FREE PARKING on Valentine’s weekend with a minimum $10.00 purchase. This offer is valid for the Main Promenade Parking Structure and The Strand parking garage. Discount cards will be available in businesses located in HB Downtown. This promotion is valid for four days: February 12-15, 2016. This Valentine&apos;s weekend, Saturday, February 13th and Sunday, February 14th, book a treatment for your loved one to enjoy a relaxing day at the top resort spa in Orange County. Enjoy the decadent Chocolate and Roses Facial, featuring all organic products designed to cleanse, exfoliate and rejuvenate your skin. With access to the 20,000 square foot spa and fitness center, saltwater whirlpools, steam rooms, dry saunas and relaxation rooms and patios, guests will also enjoy complimentary champagne, coffee and tea service, along with locally baked cake pops. Spending Valentine’s Day with your four-legged friend? 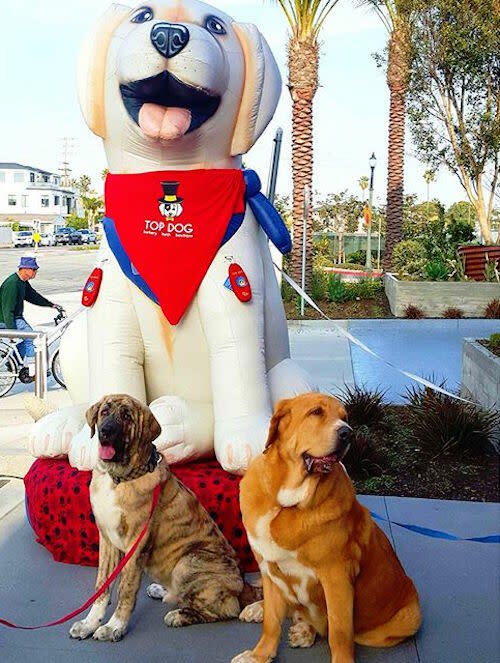 Stop by Top Dog Barkery, now open at Pacific City, for their Smooches for Pooches Valentine’s Party. Browse the toy selection, win free raffle prizes, and receive free yummy samples for your pup! Free photos will also be taken during the party on Sunday, February 14 from Noon – 3PM.